The plot of this volume focuses on the building of the ôoku. Although Iemitsu and Arikoto are very happy together, Arikoto is infertile, and Kasuga is bent on Iemitsu producing an heir. Against both their wishes, the lovers are parted, and new additions come to the ôoku. Iemitsu produces an heir with her new concubine, but she and Arikoto secretly continue their affair. In what I found to be a sweet moment, Iemitsu promises Arikoto that no matter whose child she bears, she is his and his alone—however, the rift between them grows. One of the aspects of the manga that I really like is the scenes of the lives of the commoners. While the manga focuses on the Shogunate and the daily life of those in Edo Castle, the cuts to life outside the castle—the famine, the pox, the farmers and merchants—are crucial to the world-building, as the castle and harem are very insular. 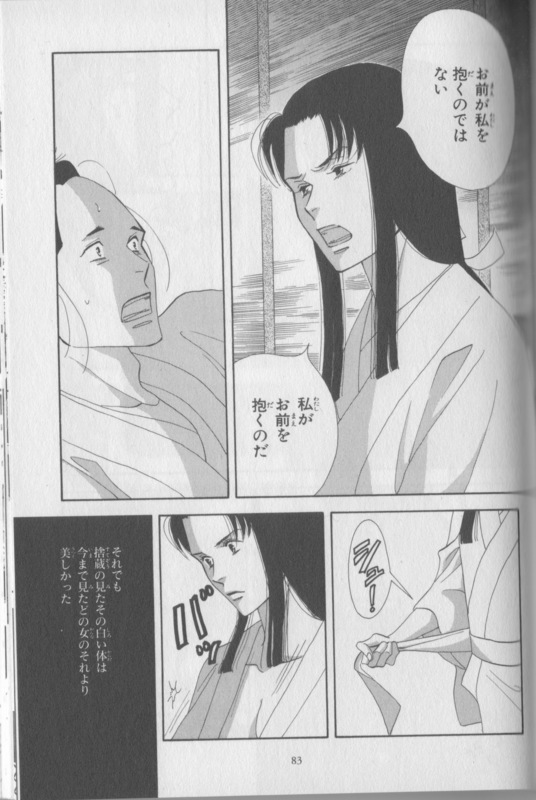 Sutezou's father reprimands him (3-37). Sutezou is introduced to us as the youngest son of a tailor who specializes in making collars for kimono. Instead of helping his parents mind the shop, he prefers to go out on the town with his lover. Instead of attributing this behavior to laziness or personality, though, his father reprimands him for acting frivolously—and femininely. The same thing happens earlier in the manga with another character’s son, and it certainly echoes the “kids these days” attitude of society toward herbivore men. Sutezou is approached by Kasuga to join the ôoku because of his striking physical resemblance to Arikoto. Personality-wise, Arikoto is more intellectual and stoic, and is, to use a college-admissions phrase, well rounded in his interests in arts and culture, his physical ability, and his intellectual capability. Sutezou, on the other hand, speaks thick, casual Edo-ben, has an eye for fashion, and loves sweets. * Edo-ben aside, the latter two aspects are associated with femininity (and herbivore men) in Japanese culture. The female name (see Volume 2) Iemitsu gives Sutezou, Oraku (お楽), really reflects his personality, as he comes off as not very deep or serious; the name also reflects Iemitsu’s feelings about him. To her, Oraku is her plaything, a bit on the side, not worthy of the love and respect she gives Arikoto. Yoshinaga goes on to show that Oraku is not a special case. She explains that a trend of favoring and pampering sons, sheltering them and treating them as the treasures of the family, has started (vol. 4). Oraku is sort of a forerunner of this—while not pampered by his parents, he longs for a life of leisure that he could attain by becoming a husband, or, in his case, a concubine. 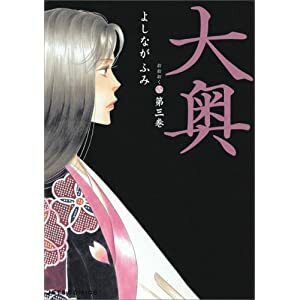 As for Iemitsu’s role in the sexual revolution, the Shogun has some amazingly culturally relevant moments in this volume, and Yoshinaga really speaks to contemporary women’s issues through Iemitsu. In the last decade, Japan’s issues with women’s bodies have focused on the Pill and the birth dearth. Japan did not legalize the birth control pill until 1999, which has been available in the US since 1960. Meanwhile, the way the birth dearth—that is, Japan’s low fertility rate of 1.4 children per woman at the time the manga was published—has been repeatedly blamed on women. ** We are too selfish, prioritizing our careers over finding a husband and bearing children, say the media and government officials, all the while ignoring the research that says that women want to have 2-3 children but the lack of adequate governmental and societal support for working parents (parental leave, better working hours, childcare) to make this a reality. There is certainly no dearth of literature on this, and I’ve put a brief bibliography at the end of some sources. Iemitsu finds herself in a similar situation. 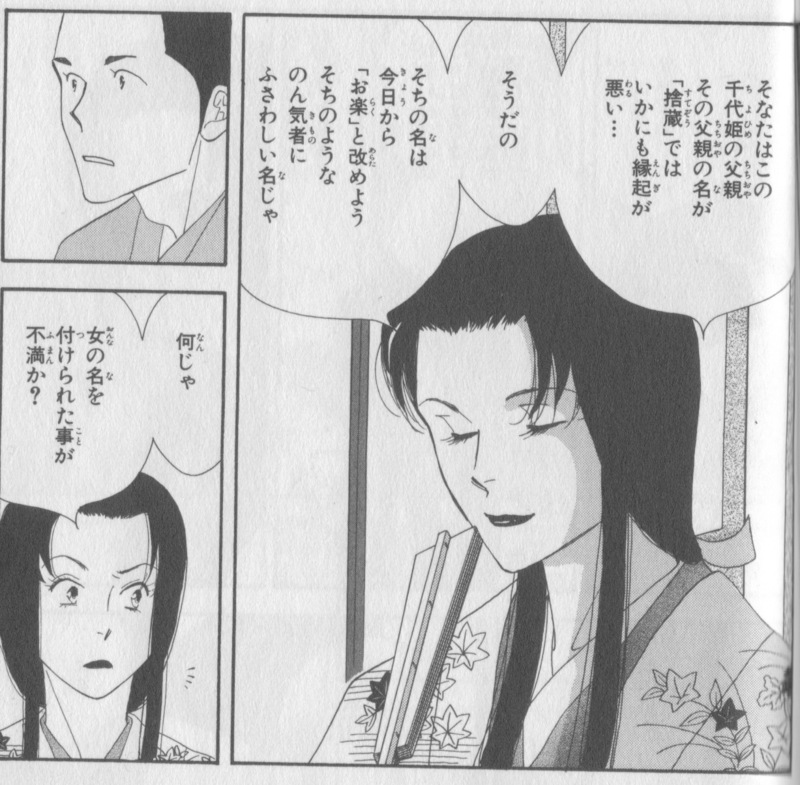 Arikoto appears to be infertile, though Iemitsu suggests that she may be the one “at fault” for their lack of heirs (vol. 3, p. 70), citing the difficulty of the birth of her daughter who died shortly afterward. 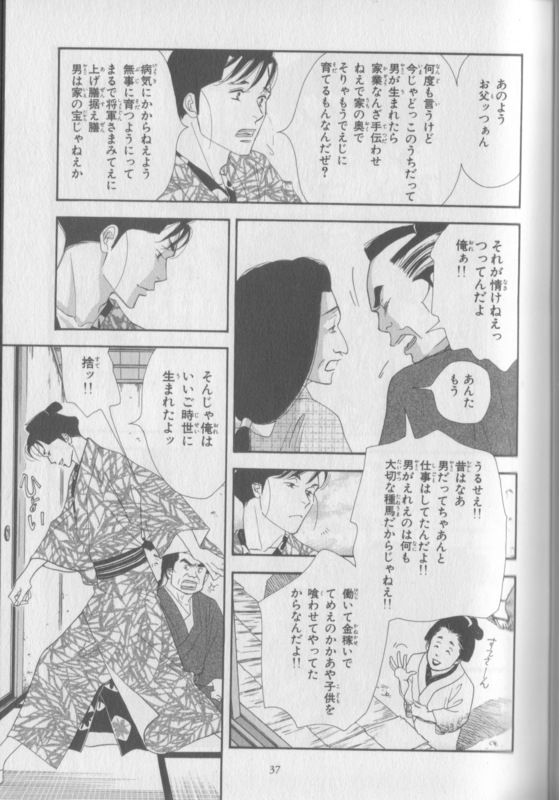 Kasuga, the wet-nurse of Iemitsu’s father (also Iemitsu), and the person who is actually in charge of the Shogunate, tries to get rid of Arikoto, and in an effort to save his relationship with Iemitsu, he suggests that she sleep with other men in order to produce an heir. Iemitsu is horrified by the thought, and beats Arikoto, yelling, “I’ll be the only one to choose if other men are to have me!” (vol. 3, p. 67). This situation reminded me of one of the other examples that came up a lot in the mid ’00s: Crown Princess Masako’s “failure” to produce a male heir. (Tim Larimer’s 2004 “Japan’s Latest Craze” does a great job summarizing the issues.) Masako, an educated career woman, was 31 when she married Crown Prince Naruhito. Perhaps if she had married a “normal” man, not having any children or just having one child would have been a perfectly acceptable life choice, but there was intense pressure on her—and other women who marry into powerful traditional families—to conform and produce a male heir. Even before the birth of her nephew, who will be in line for the throne before her daughter, Masako withdrew herself from the public eye due to emotional issues. A tender moment. Vol. 3, p. 18. While I can’t speak for Masako’s personal feelings about her “duty to the state,” Iemitsu, however, isn’t interested as using her body as a tool of the Shogunate at first. Though she isn’t opposed to having a child, she doesn’t want to abandon Arikoto, the only one of the harem she favors, to do so, and the thought of sleeping with a “normal” man completely repulses her. Arikoto is precisely what all the men she knows are not—even if he is not her equal in station, he values her highly, treats her like an equal human being, and is kind, loving, gentle, and attentive, a sort of Edo-period “predecessor” of Masamune Asuka from Otomen. The glimpses of their love scenes are very tender and come off as gender neutral—no talk of women or men, or of gendered power and position, just two people in love. In the next sections, I will discuss the changes in the political world that provide the women other than Iemitsu with cultural agency, and then discuss the cultural changes in the world outside the castle. Published 2007/12/20 (Vol. 3) and 2008/12/24 (Vol. 4) by JETS COMICS (subsidiary of 白泉社). This review refers to the original Japanese version, available at Amazon.co.jp. The English translation of Vol. 3 was published on 20 April 2010 by Viz Media and is available at amazon.com. Vol. 4 was published on 17 August 2010. The translator is Akemi Wegmüller. *As the son of a tailor, this is hardly surprising, but the other men of the ôoku find it a bit odd. ***This is a fairly liberal translation, and it’s hard to render the Japanese into English. She literally says “You will not embrace me. I will embrace you” (「お前が私を抱くのではない。わしはお前を抱くのだ。」) in Japanese, but I feel like take is a better rendering for ease of understanding here. **** See Kinou Nani wo Tabeta? (「昨日何を食べた?」, What Did You Eat Yesterday? ), a contemporary piece about a lawyer who loves cooking and his hairdresser boyfriend. The manga is mainly about food and relationships but tactfully addresses a number of social issues concerning the characters’ sexuality. Allison, Anne. (1996). Permitted and Prohibited Desires: Mothers, Comics, and Censorship in Japan. Boulder, CO: Westview Press. Uno, Kathleen S. (1991). “Women and Changes in the Household Division of Labor.” Bernstein, Gail Lee, ed. Recreating Japanese Women, 1600-1945. Berkeley, CA: University of California Press: 17-41. White, Merry I. (2002). Perfectly Japanese: Making Families in an Era of Upheaval. Berkeley: University of California Press. Yamada, Masahiro. (2006). “The Real Story Behind Japan’s Marriage Crisis.” Japan Echo 33.1: 20-24. Also, see this interview with Judith Butler, particularly her comments on biology and pregnancy. Japan does not have a “birth dearth”. It has an “immigration dearth”. The native birth rate for all developed nations is below replacement (the total fertility rate for native-born US women is about 1.8, for most European countries it’s about 1.5; replacement is 2.1); population growth is maintained by immigrants and their first-generation offspring. In other words, the developed countries stave off demographic collapse by importing people from less-developed countries with higher fertility rates. Few countries have been successful at persuading educated native-born women to have more kids; liberalizing immigration is much more effective. I added in a link to the CIA’s comparative site on global fertility rates, and the US’s estimate for 2011 is 2.06/woman. Japan, of course, is not the only country with a lower birth rate (Japan is near the bottom), and the issue of the low fertility rate with the aging population is certainly the cause of concern for those who are concerned. The options I usually found presented in Business Japanese were 1. hire more women (which would require more societal support for families); 2. hire more foreigners (which, as you pointed out, would require relaxation of immigration laws, visa support, etc. ); or 3. use robots (seriously).